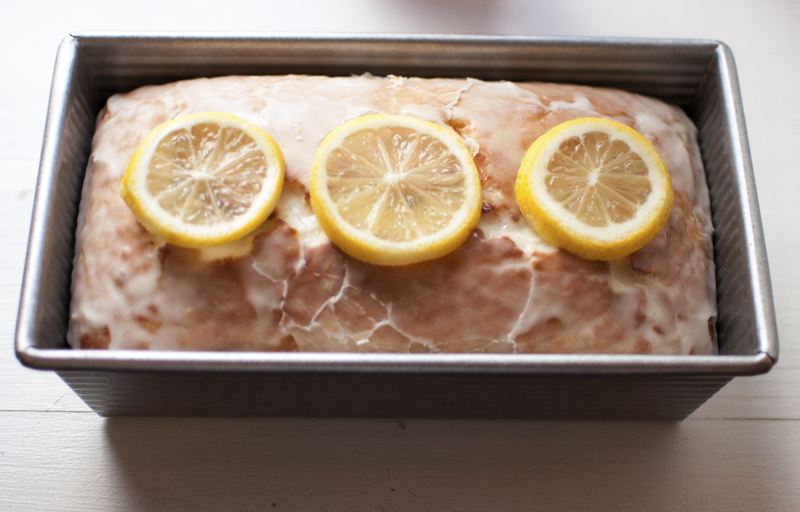 Lemon Loaf Cake with Lemon Glaze. As a presumed side effect of all my baking shenanigans over the years, I have come to learn [and accidentally memorize – my memory is weird; I swear I don’t keep creepy files on anyone!] my coworkers’ and friends’ food preferences. Apparently some people don’t like citrus, or at least not in their baked goods. What? Who ARE you people? I really try to be nonjudgmental, as everyone’s tastes are different. I’m also a huge fan of citrus: orange, grapefruit, lemon, lime… I love them all. So, so good. In my cooking, in my baking, in my smoothies, and just in general. Maybe I’m biased. But I just don’t get it. What is not to love about lemon, or any other citrus fruit for that matter? All that to say, if you don’t like citrus – particularly lemon – then you should probably run away from this blog post right now (I’m still trying so hard to not judge, but it’s just one of my weaknesses in this case). Because I’ve already professed my undying love for lemons and citrus fruits – and now I’m about to delve even deeper. PS: If you don’t like citrus – can you please enlighten me as to why you don’t like the flavor? Despite the fact that this post is riddled with sarcasm, I actually don’t mean to sound snobby when I ask that question. As someone who practically loves every flavor known to (wo)man, I just don’t understand why people don’t like citrus. Seriously. Inquiring minds want to know. 🙂 And I’d also argue that even if you think you don’t like citrus in your baked goods, you should still give this loaf a chance. 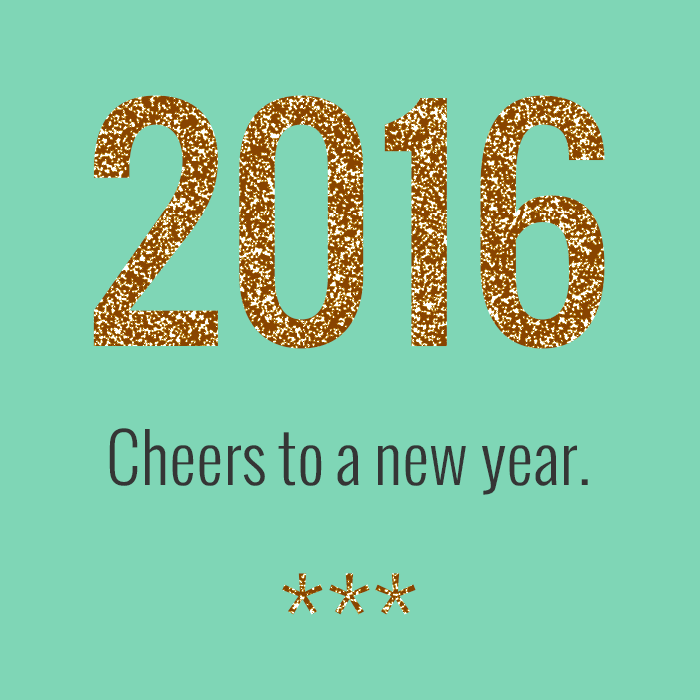 You might find that you’re pleasantly surprised by it. 1. Preheat your oven to 350 degrees F. Spray a 9×5″ loaf pan with cooking spray, and line with parchment paper (or grease/flour the pan); set aside. 2. 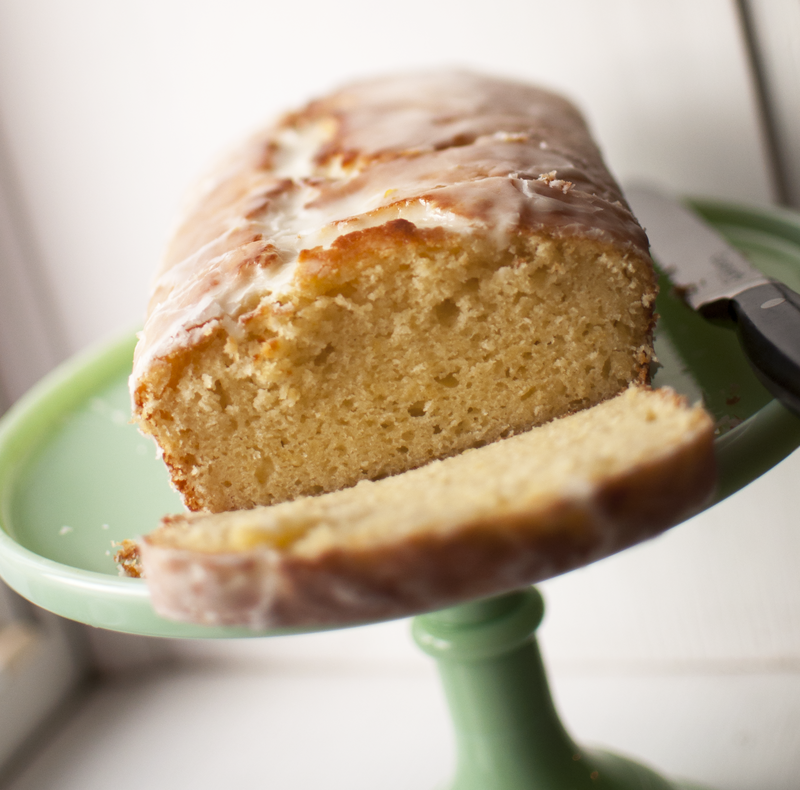 To make the lemon loaf: add the eggs, sugar, and sour cream to a large bowl and whisk well until smooth and combined. 3. Drizzle the oil into the first mixture, and whisk to combine. 5. Next, add the flour, baking powder, and salt, and stir until just combined. Be careful to not over-mix. The batter will be slightly lumpy, but that’s okay; don’t attempt to stir them to make the batter smooth. Pour the batter into your prepared and smooth the top lightly with a spatula if necessary. 7. Allow the cake to cool in the loaf pan on top of a wire rack for at least 30 minutes, then turn it out onto the rack to cool completely. 8. 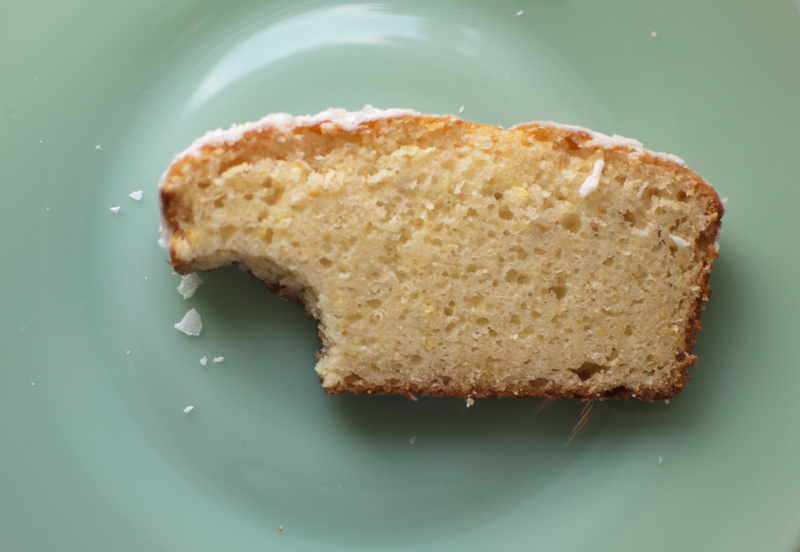 To make the lemon glaze: add the powdered sugar to a small bowl, and slowly add in the lemon juice. Whisk until smooth and combined. Feel free to experiment with the sugar to juice ratios for your desired consistency and flavor. I added more lemon zest to the glaze for aesthetics and an extra burst of flavor. Evenly drizzle the glaze over the cooled loaf, then slice and serve. Loaf cake should keep well for several days in an airtight container. Enjoy! + Recipe via Averie Cooks. Random Sides // Cooking for One: Part I [Tips + Tricks]. It recently dawned on me that I seem to get quite a few questions from my friends and acquaintances on my cooking shenanigans – particularly related to how I cook for one. I thought it might be useful if I compiled a post with all my tips and tricks that I’ve learned. Obviously, I am by no means an expert. I didn’t go to culinary school, and I make mistakes allllll the time. But I have been cooking – more or less – on my own for the last 10+ years, so it’s safe to say that I have learned quite a bit over time, mostly through trial and error [and a few cooking classes here and there]. This post is going to be divided into two separate parts, mostly because I can’t help but ramble on subjects about which I am constantly thinking. In this first post – aka Part I – I am going to just discuss my thoughts and some general tips and tricks. In the next post – aka Part II – I will add more resources for recipes and inspiration, so that’ll be filled with lots of links and pretty pictures. In the meantime, let’s get started with Part I! Part I: My General Tips + Tricks + Thoughts on Cooking for One. Good life skill to possess: When you’re knowledgeable in a kitchen, it just makes you feel like such a badass. Throwin’ down in the kitchen like a boss makes me feel as if I am winning at #adulting, despite the fact that I still don’t understand the point of taxes (I’m only partially kidding). It’s just a great way to learn and grow as a person. Heck, we all have to eat; might as well make the most of all this planet has to offer us as far as food is concerned, ya know? Cost savings galore: Unless you’re shopping at Whole Paycheck – whoops, I mean Whole Foods – all the time, cooking at home is a great way to save some paper [and by paper, I mean money]. It’s often healthier: When you cook or bake something yourself, you know exactly what goes into it. It then becomes easy to make healthier choices in regard to food. Don’t get me wrong; I still love comfort food (and I’ll cook it for myself with no shame) just as much as the next person. But it’s nice to know that, for the most part, I have complete control over what goes into my body. I have loosely devised a “meal rotation plan,” and I (more or less) stick to it. From that rotation, I plan for and cook about two or three meals per week. Those two or three meals will get me by, depending on my plans for a given week [e.g. going out to eat with friends, working at the cooking school and getting fed, etc]. 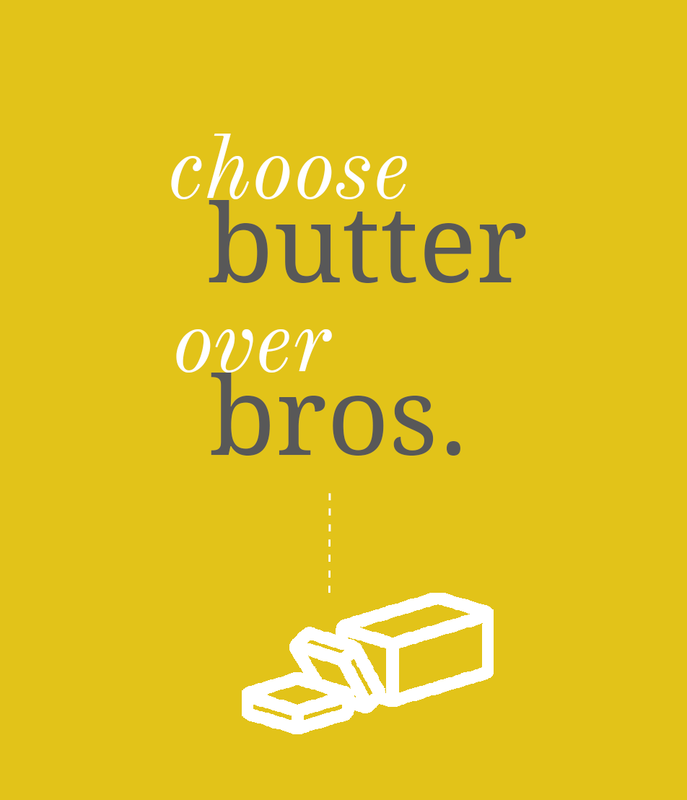 Note: I will share a sample meal rotation plan that I follow at some point on this blog, if y’all are interested. Cut recipes in half, and sometimes in half again: Most recipes make amounts that will serve 4+ people. Obviously, that’s pretty unnecessary for a single person (and even two people). When it comes to cooking, halving a recipe is easy. With baking, reducing recipes does get more tricky, so I usually tend to avoid that. However, as a general rule of thumb, any time I am looking at a recipe for a meal, I will automatically halve it just so that I don’t have so much darn food laying around. It greatly reduces food waste (which I hate), and it is better for portion control. Sharing with friends: If you don’t want to or can’t cut a recipe in half, why not invite a friend or two over for dinner? 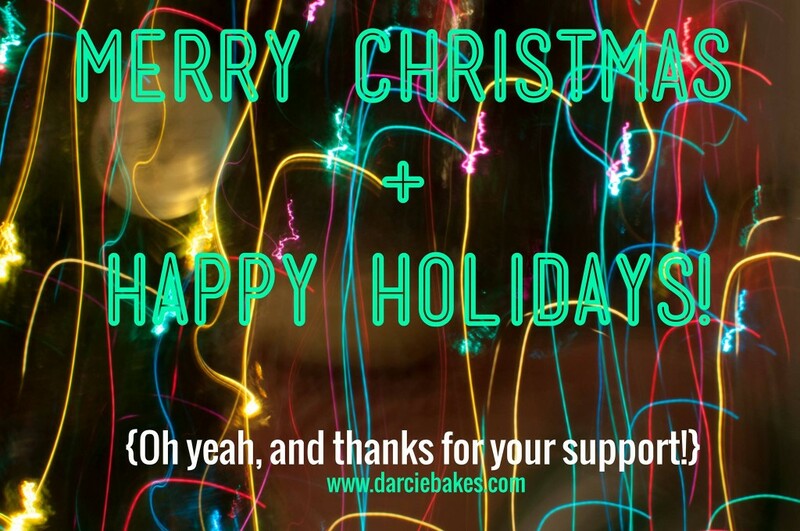 You can cook together, or offer to do all the cooking and serve everyone dinner [tell a friend to bake some cookies or bring some booze in return!]. Eating is such a social activity for humans, so sharing your meals with others is a great way to bond, eat delicious, home-cooked food, and ensure that there’s less waste. Learn to love leftovers: Orrr don’t. When it comes to The Great Leftovers Debate, I’m pretty sure that people either love or despise leftovers. There doesn’t seem to be much of an in-between. My opinion on leftovers is as follows: some things are fantastic for leftovers [e.g. chili and fried rice], but with most meals, I kind of hate leftovers. All that to say, as I get older, I have forced myself to tolerate leftovers a bit more, simply because it’s easier and more cost-effective to consume leftovers. Grocery lists are your BFF: I’m a list maker at heart, but seriously, making a list of everything you need before you walk into a grocery store is extremely beneficial. It will keep you on task and ensure that you don’t buy all of aisle five. Think about what sounds good to eat for the week, then look up recipes and make a list of ingredients that you need. I also like to organize my grocery lists by section of the store. For example: all of my dairy items are listed together, all baking ingredients are written down together, etc. This keeps my scatter-brained self much more at ease when I’m shopping for ingredients. The crockpot is also pretty nifty: If you are in your 20s or 30s and do not own a crockpot, do yourself a favor and go get one right meow! They come in all different sizes, and there are a boatload of recipes out there just waiting for you. Crockpot meals are usually pretty simple, and they’re often perfect for busy young professionals. It’s okay to go out to eat. I try to limit how often I go out to eat, but since I’m a self-proclaimed foodie, it’s probably pretty obvious that I enjoy trying out new restaurants. And I’ll admit it: I even give into my sick, vile Arby’s craving once every month or two [dem curly fries doe]. All of these things are fine in moderation; I just prefer to cook my own meals about, oh, I’d say 87% of the time. I will say that it is much easier to forgive myself for giving into my occasional curly fry craving when I know that I cook/eat mostly healthy meals. It’s okay to not know what the heck you’re doing: Cooking seems to baffle many folks, but most of it’s not that difficult to figure out. We have almost no excuse to not try to learn how to cook nowadays, with all of the online resources (blogs, Google, YouTube videos), etc. Be open to learning new things, and definitely be creative and have fun with it: Don’t take cooking [or yourself for that matter] too seriously. Again, everyone has to eat to survive, so you might as well goof around and have fun with something that’s essential to your survival and health! Sometimes I’ll be a total dork and pretend I’m on a cooking show. Other times I will practice mindfulness when I’m cutting up a dang sweet pepper. The bottom line is this: If you can pay attention to the science behind food and know how to follow directions, then you’re golden: With those skills, you can learn how to cook pretty well, especially for a single person. All it takes is a little determination and practice! 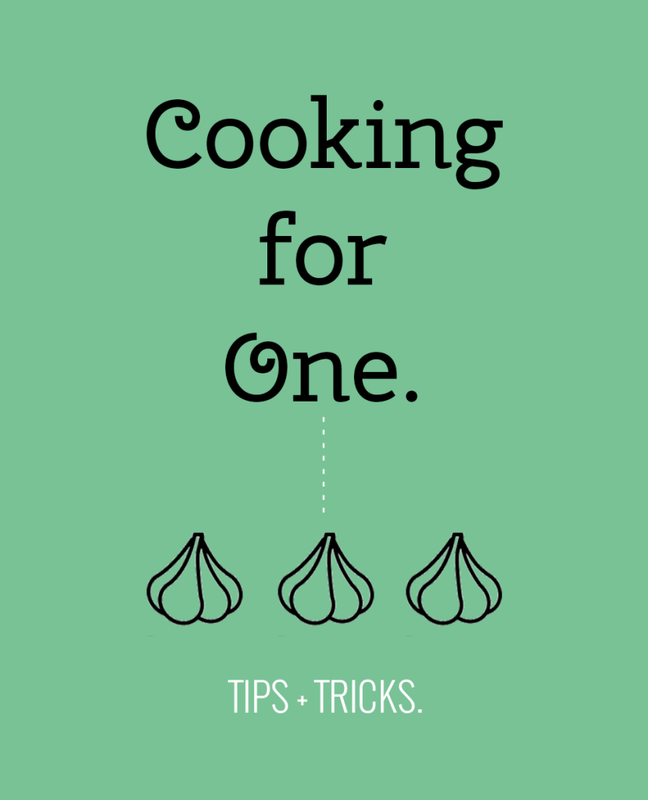 *Got any of your own hints/tips/tricks when it comes to cooking for a single person [or even two people]? Let’s hear it! 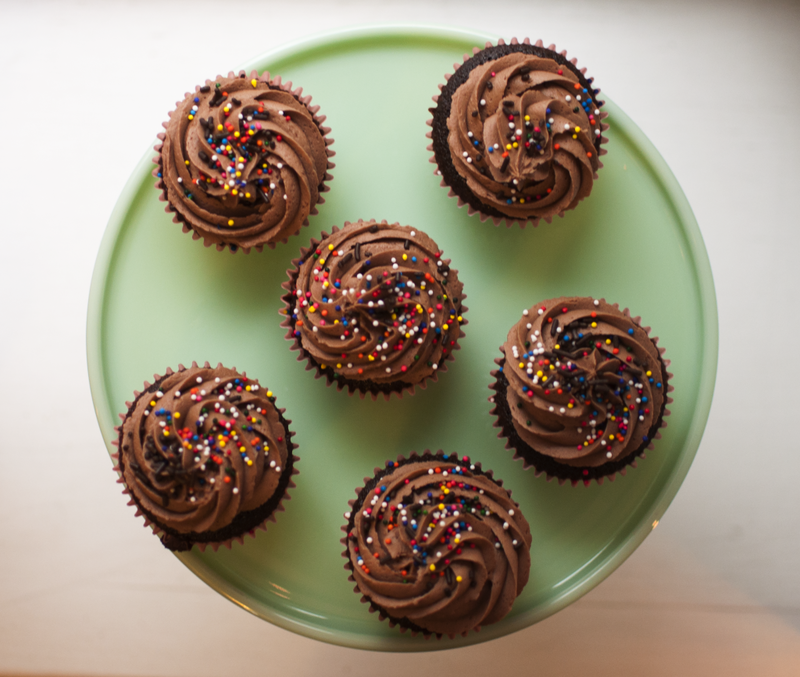 The *Best* Chocolate Cupcakes [With Cocoa Buttercream]. It has to be moist. Dry cake is just…Ugh. No one has time for that. It must have a sinfully rich chocolate flavor. I don’t want a mere hint of chocolate; I want to be hit IN THE FACE with the chocolatey goodness. It should have a nice balance of being light ‘n fluffy but also a tiny bit dense. It should almost always be topped with some kind of chocolate frosting [I’ll accept vanilla bean frosting, though]. 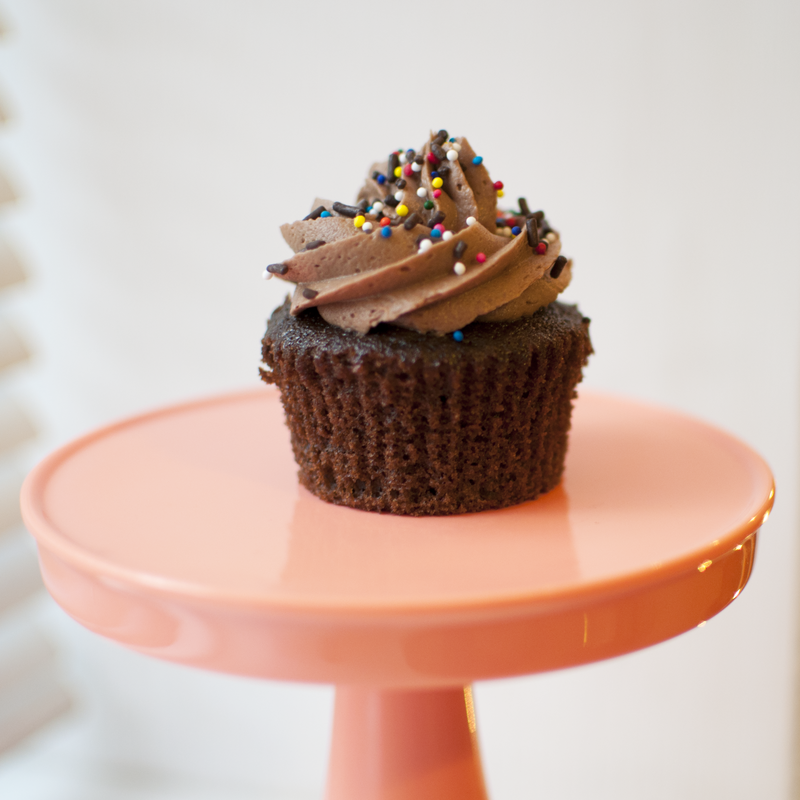 The Best Chocolate Cupcakes with Cocoa Buttercream Frosting. Yield: Sixteen (16) regular-sized cupcakes. 1. Preheat your oven to 350 F. Line two muffin tins with sixteen liners; set aside. 2. In the bowl of a stand mixer, mix butter and sugar until completely combined; it will look like wet sand. 3. Melt the chocolate in the microwave according to instructions, or over a double boiler. Allow the chocolate to cool to touch. Once cooled, add it to the butter/sugar mixture, and mix until it’s just combined. 4. Add in the eggs and egg yolks, one at a time, and mix until just combined. 5. Next, add in the oil, vanilla, and sour cream. Mix until just combined. 6. In a separate, medium-sized bowl, sift together the dry ingredients [flour, salt, baking soda, cocoa powder, and espresso powder]. Use a whisk to ensure that the dry ingredients are all well-incorporated after sifting. 7. Add the dry ingredients to the wet ingredients in three additions, mixing until just combined after each addition. 8. Add in the water, and mix until just combined. Scrape down the sides of the bowl with a spatula as needed to ensure that everything is properly incorporated. 9. Fill prepared cupcake liners about 2/3rds of the way full, and bake for about 18 minutes. Check for doneness at the 18 minute mark; a toothpick inserted in the center of a cupcake should come out clean (or with a few moist crumbs is also fine). If not done, bake for another minute or two until done. 10. 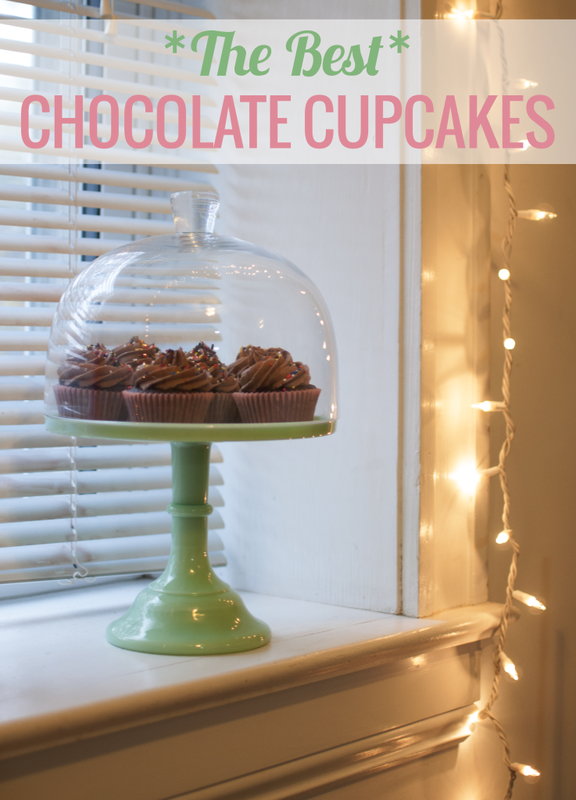 Allow the cupcakes to cool completely on a wire rack, then frost as desired once they’re completely cooled. 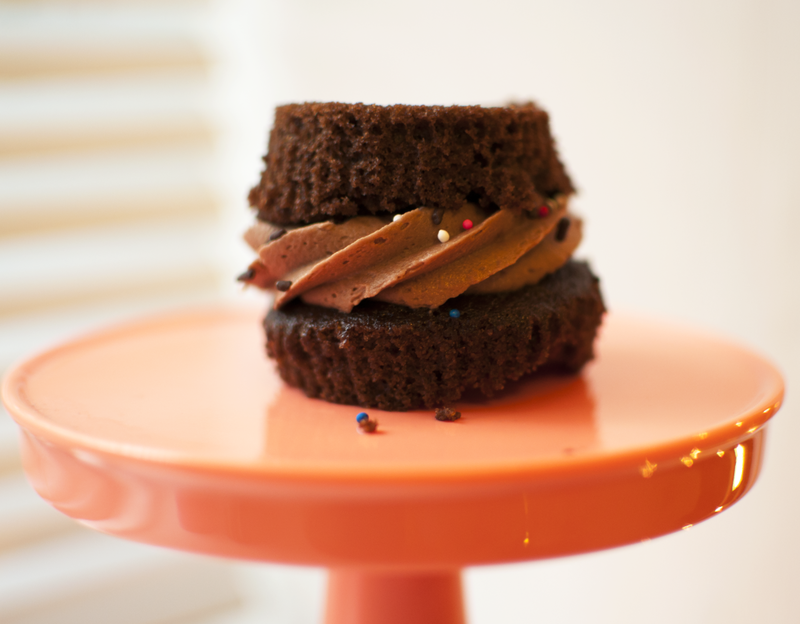 *For the frosting: I used The Cupcake Project’s Vanilla Frosting Recipe. I simply doubled the recipe, and added probably about 1/3 cup of cocoa powder, plus some heavy cream to make it extra creamy. Feel free to play around with any frosting recipe that you like! + Chocolate cupcake recipe via The Cupcake Project. French toast is one of those breakfast foods that I rarely eat. Obviously, it’s delicious. 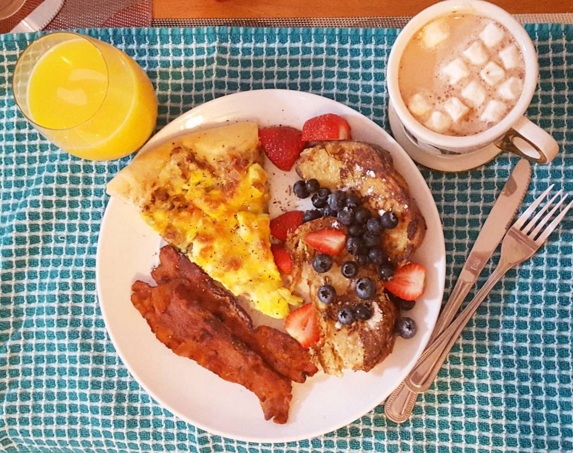 I tend to eat pancakes and waffles more often; French toast is a breakfast that’s been relegated to that “fancy schmancy breakfast” category in my brain. And that’s kind of silly, is it not? 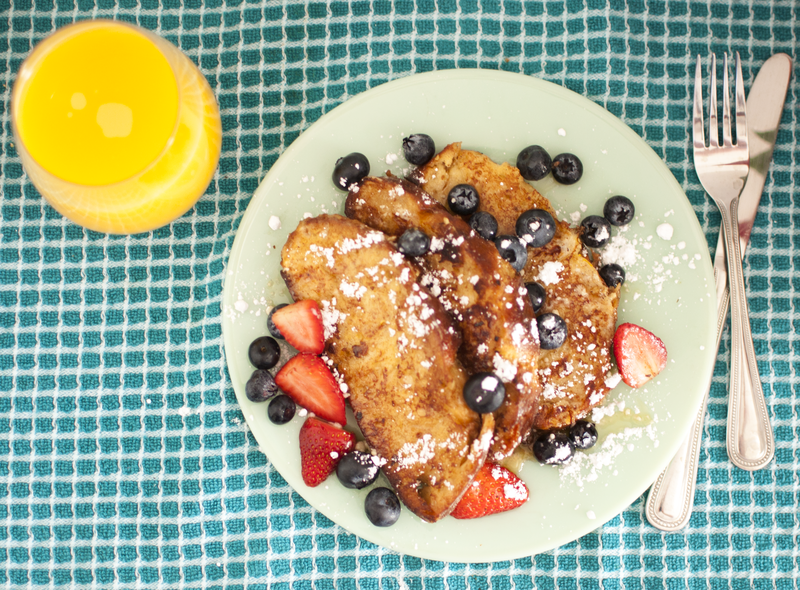 After all, French toast is basically just egg-fried bread. French toast, does however, require specific breads to be delicious. My usual go-to, store bought (gasp!) bread is a simple, whole wheat/whole grain (sometimes a honey oat wheat) bread, and that would not translate well to French toast. If I’m going to make French toast, then at least some preparation and forethought has to be involved. I guess that’s why I don’t eat it very often. As a single person, I can’t exactly have an entire loaf of Texas toast bread or challah or brioche laying around… Because I would eat it all on its own before even getting around to using it for the dang French toast! But every now and then, I get a fierce craving for some homemade challah (recipe coming soon!). I absolutely love making and eating challah. My current go-to recipe makes two loaves, so after I’ve pawned a bunch of it off on other people, I always end up having extra challah. 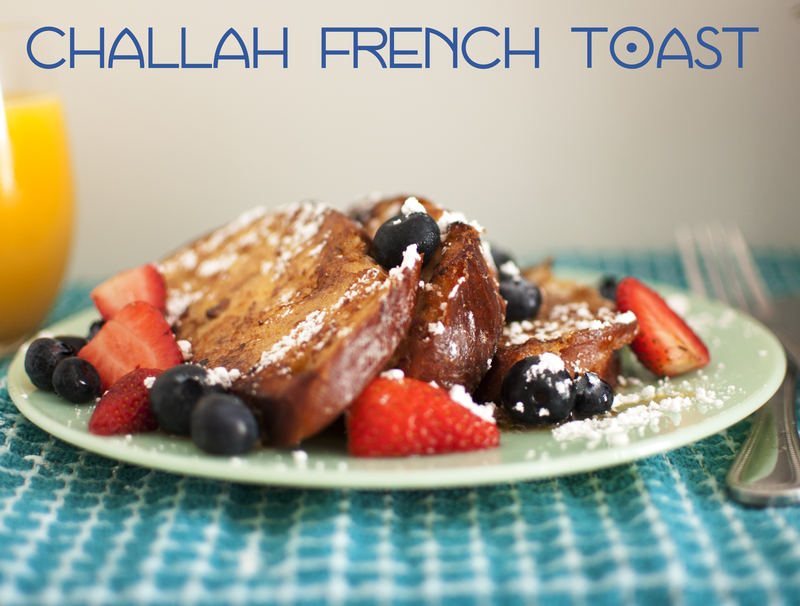 It should be considered a cardinal sin to waste something as delicious as challah, and it just so happens that stale challah is perfect for making French toast! Challah is already an egg-based bread, so it just makes sense that frying it up in an egg-based mixture will bring it back to life. 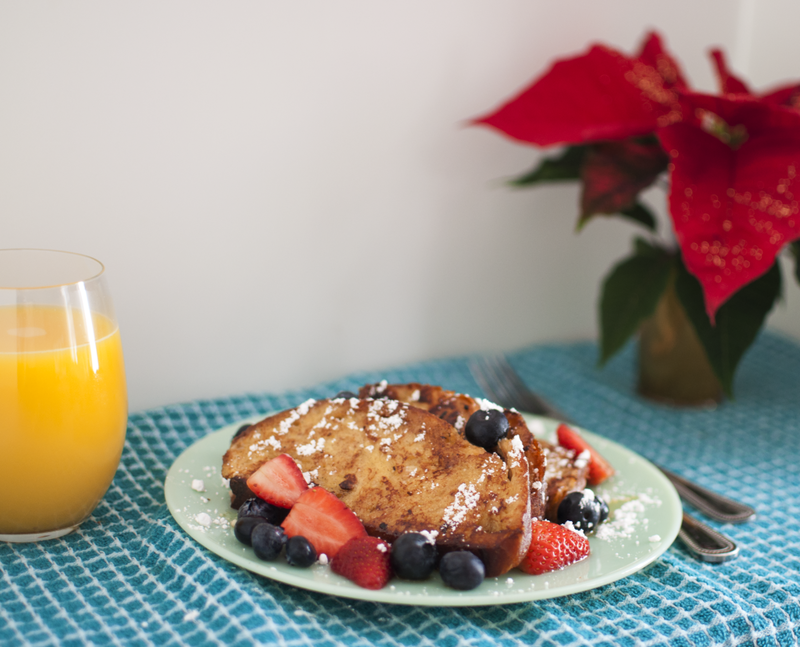 The recipe for this challah French toast is basically my original recipe (although I’m sure the same recipe exists somewhere out there), but it is adapted from the infamous Ina Garten. I made it for a “Friendsgivingmas” [my roommate made up that word, haha] feast a few weeks ago, and it was a hit! It should go without saying that starting with something already delicious [aka challah] and repurposing it with a few ingredients will make it that much more delicious. Yield: A lot. Haha. This will easily serve six people. It tends to reheat well as leftovers, too. In fact, I was nuking leftovers at work the next day. 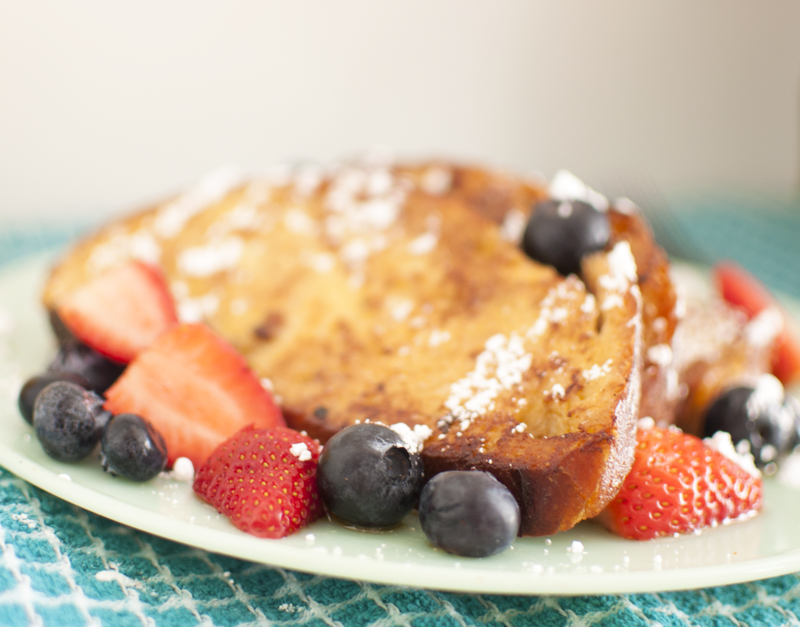 – Optional toppings: berries (strawberries and blueberries pair wonderfully with this! ), powdered sugar, and real maple syrup. 2. In a large, shallow bowl, whisk together the eggs, half-and-half/milk, orange zest, vanilla, and honey. Whisk the cinnamon and salt in a separate small bowl, then add it into the liquid mixture. 3. Slice the challah into about 3/4-inch thick slices. Soak as many slices in the liquid mixture as possible for about 2-3 minutes, turning once. 4. Heat one tablespoon of butter and one tablespoon of oil in a large saute pan over medium heat. Add several soaked bread slices at a time, and cook for 2 to 3 minutes on each side, or until the slices are nicely browned on both sides. 5. Place the cooked bread on a cookie sheet and keep it warm in the preheated oven until ready to serve. Continue frying the bread as aforementioned in step four until it’s all fried up. You’ll need to add more butter/oil as time goes on to continue frying. Serve hot with fresh fruit, fruit preserves, powdered sugar, and/or real maple syrup. + Recipe adapted from Ina Garten, via The Food Network. I’m gonna need you to stop what you’re doing right this instant and grab the supplies needed to make these candied pecans. There’s a good chance that you already have all of the ingredients in your pantry, minus the pecans. I’d be lying if I said I have any self-control around them. Once you start eating “just a few,” next thing you know you’ve eaten an entire cup. Oops. They’re just so tasty. 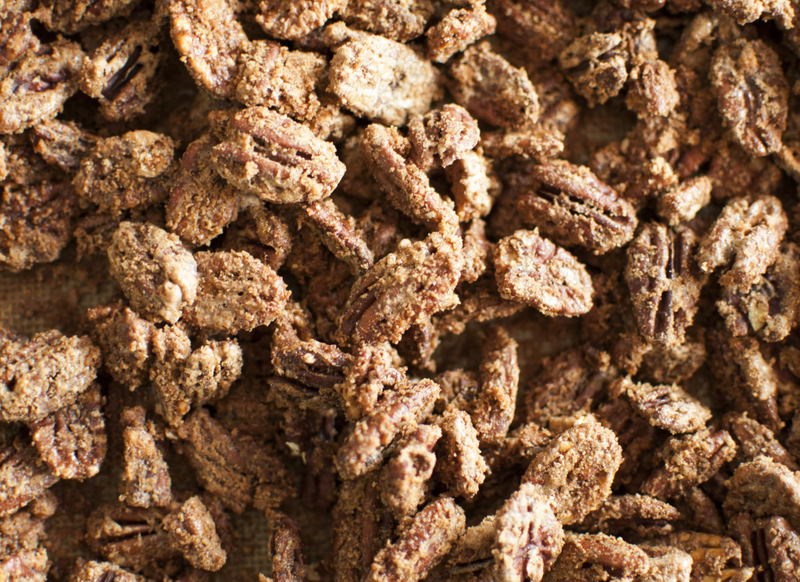 Roasted pecans, topped with a delicious, crunchy sugar coating that has a good hint of cinnamon… How could that ever be a bad thing? 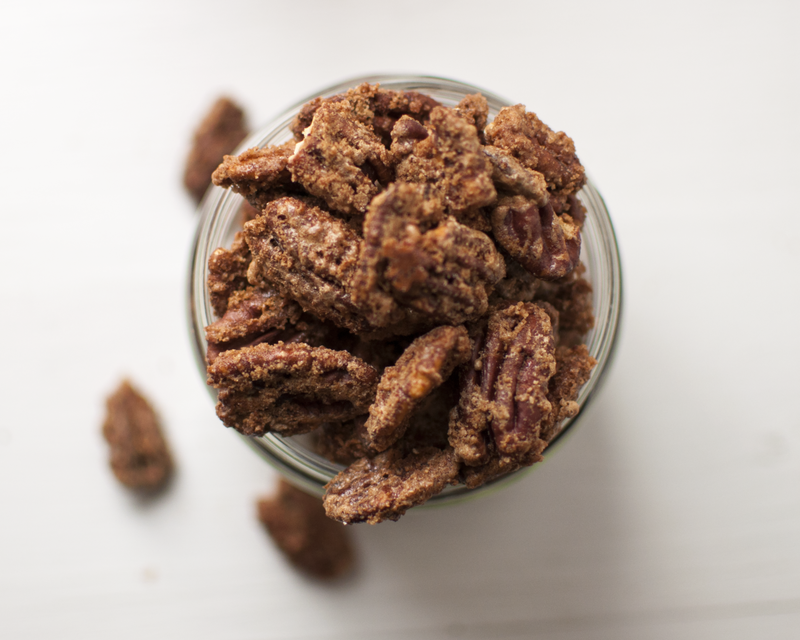 Candied pecans are also extremely versatile: you can use them as a salad topping, gift them to your loved ones for Christmas, or just make a batch and try to play a game with yourself in which you don’t consume the entire batch in one sitting. Regardless of your reason for making these [tbh, you don’t need a reason], just make them. They are so tasty, and they will make your house smell heavenly. My apartment always smells fantastic when I’ve got these things roasting in the oven. Best snack ever. 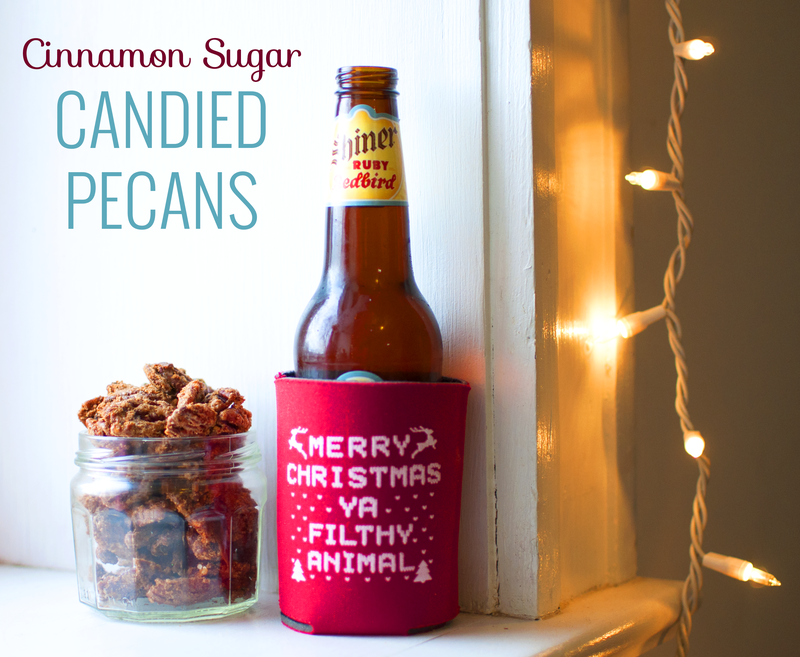 Make them right meow so you can eat them all Christmas weekend. The end. Yield: 4 cups of the most delicious candied pecans on the planet. 1. Preheat your oven to 300 degrees F, and line a large baking sheet with a Silpat or parchment paper. Set prepared pan aside. 2. In a medium bowl, combine the sugars, cinnamon and salt. Set aside. 3. In a large bowl, add the egg white, vanilla extract, and water together and whisk until frothy. 4. Add the cinnamon sugar mixture to your wet ingredients, and stir until combined. Toss with the pecans until they’re well coated. 5. Spread the coated pecans out onto the prepared pan in an even, single layer. 6. Bake for about 40-45 minutes, stirring every 15 minutes. The sugar mixture will harden on the pecans, especially as they setup and cool off. 7. Remove them from the oven and allow them to cool on the baking sheet. 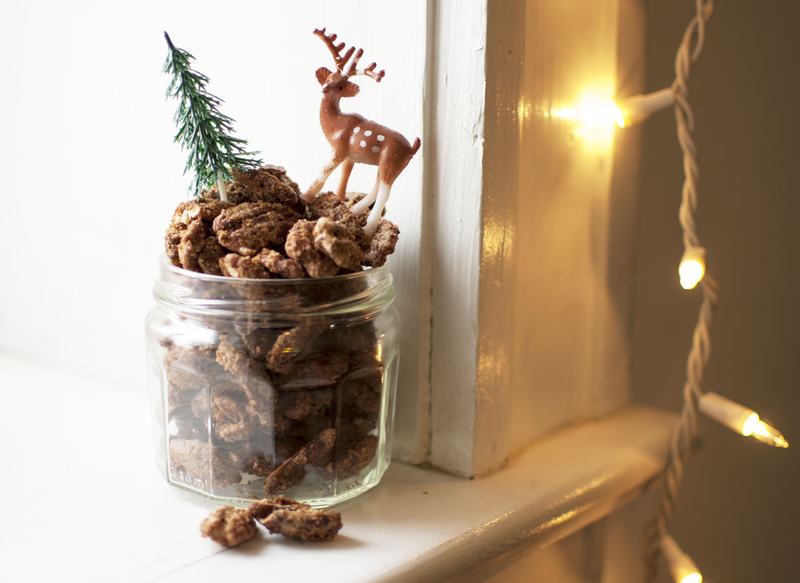 Once cool, store the candied pecans in an airtight container. They will be good for about a month, but it’s highly unlikely that they’ll last longer than a week. + Recipe from Two Peas and Their Pod. One of my favorite guilty pleasure* hobbies OF ALL TIME includes listening to copious amounts of rap and hip-hop. Usually I can be found listening to lots of modern songs, but I am gonna go ahead and throw it out there: I have a “2000s Hip-Hop” station on my Pandora account, and it’s one of my favorite playlists to throw on when I wanna get pumped up. *I actually have zero shame, tbh. I mean, let’s be honest: who doesn’t like “Laffy Taffy,” “Salt Shaker,” “U and Dat,” and other songs?! They’re just classics for those of us that grew up in the early 2000s. Do you know what that means, man? She got her own house, she got her own car. 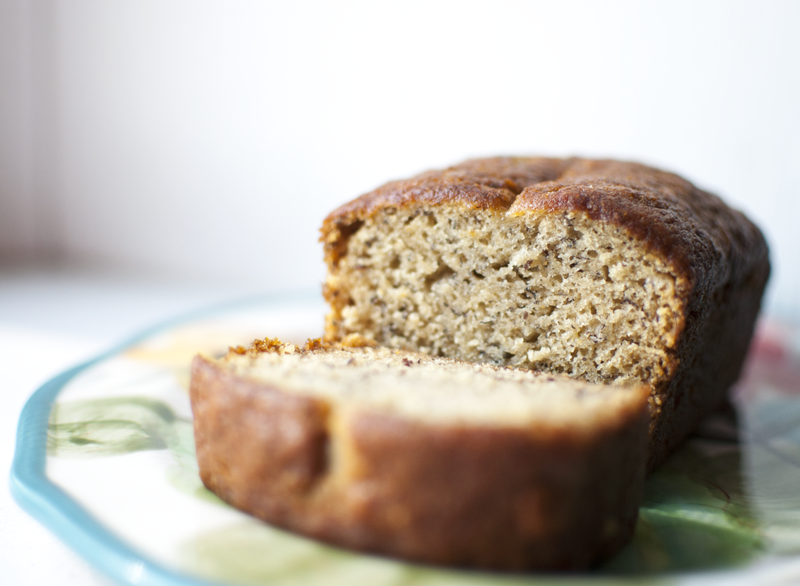 If you’ve made it this far in this post, you’re probably wondering what in the heck hip-hop music has to do with a food blog or better yet with banana bread. 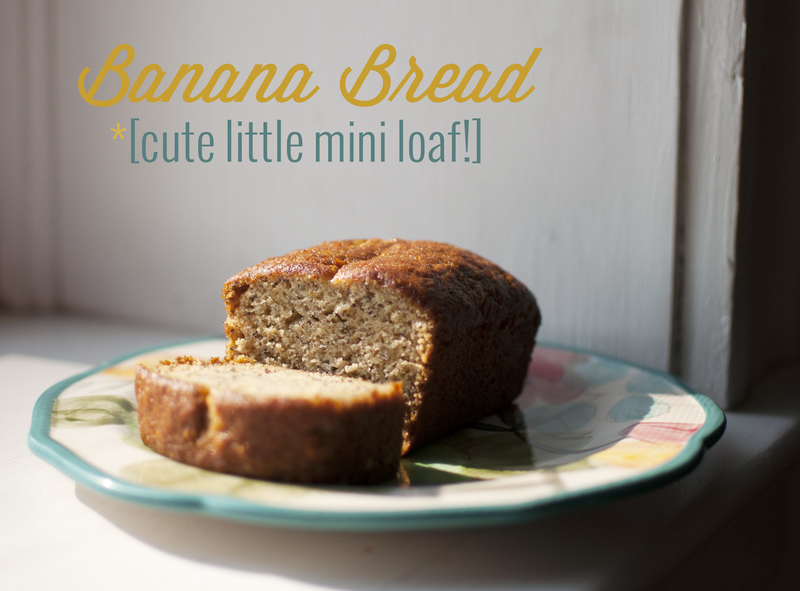 Well, this isn’t just any ol’ nanner bread recipe. 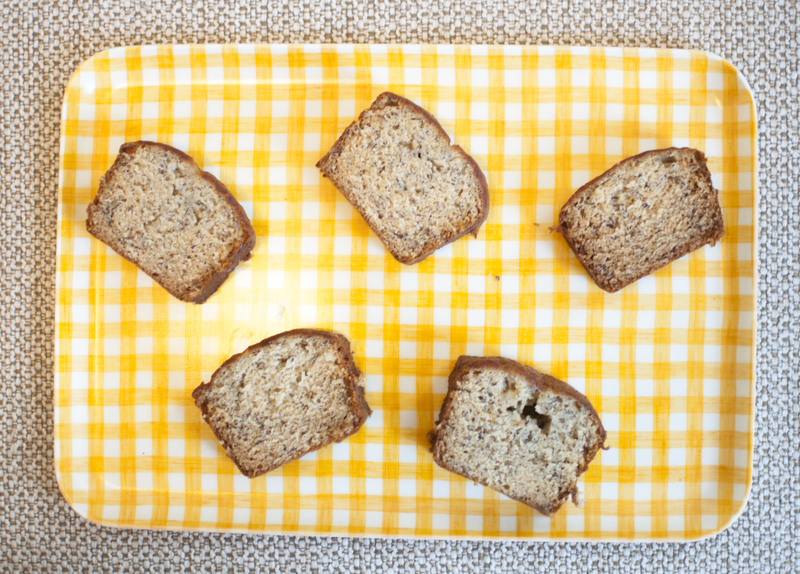 This recipe is for one single miniature loaf of banana bread. 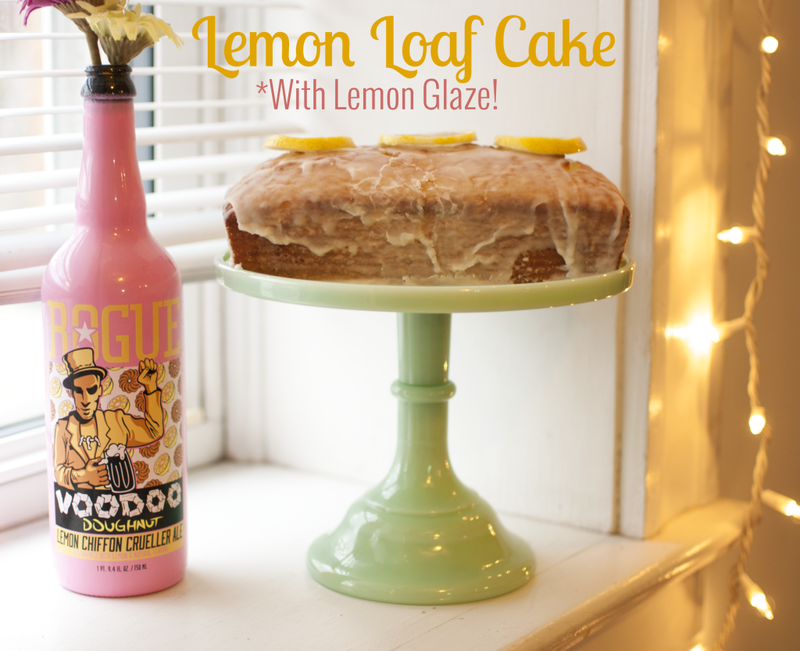 It’s an adorable, delicious little loaf, perfect for a badass, independent chick (or dude) such as yourself. You could technically share it with your significant other, if you have one and felt so inclined. But it’s also a nice amount for one person. Well, I’m not gonna lie. I ate the entire loaf in what was probably more than a 24 hour period but less than a 48 hour period of time. 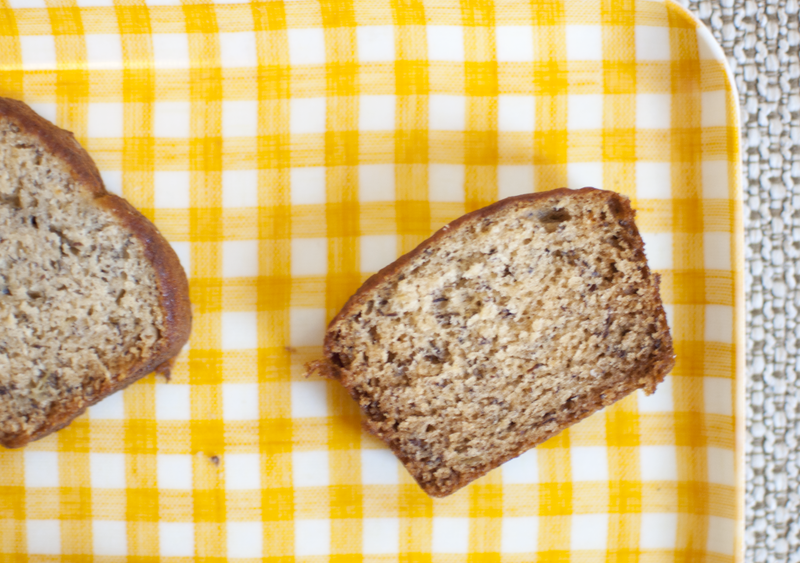 It’s juuust the right amount of banana bread to satisfy a craving, plus use up that single overripe nanner that’s sitting on your counter, daring you to use it for something (but of course, one banana is never enough for a regular-sized loaf of bread). Yield: One small loaf (a miniature loaf pan’s dimensions are usually about 5 ¾” x 3” x 2”). 1. Preheat your oven to 350 degrees F. Grease a 5 ¾” x 3” x 2” mini loaf pan with butter or cooking spray (and a little parchment paper!). Set aside. 2. In a medium bowl, mash the banana into a puree using a fork or potato masher, if you have one. Next, add the butter, sugar, and honey to it and stir well. 3. Stir in the egg yolk well. Finally, sprinkle in the dry ingredients: flour, flax seed meal or wheat germ, baking soda, and salt. 4. Bake for 35-40 minutes, or until a toothpick inserted comes out clean. Let cool in the pan slightly before moving it to a wire rack. Enjoy! + Recipe via Dessert for Two. 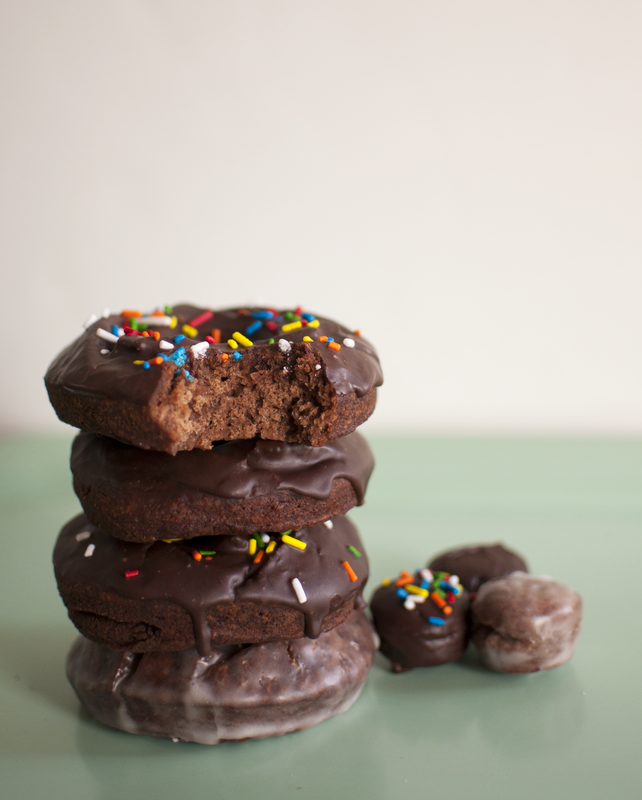 RBE // Old-Fashioned Chocolate Cake Doughnuts. When I was a kid, nearly every Sunday before or after church, my parents would take us to this little local doughnut shop called Royal Donut. And every time we went there, I always consumed three doughnuts in one sitting (RIP Darcie’s childhood metabolism). Out of the three doughnuts I snarfed down, one of them had to be a double chocolate fried cake doughnut. 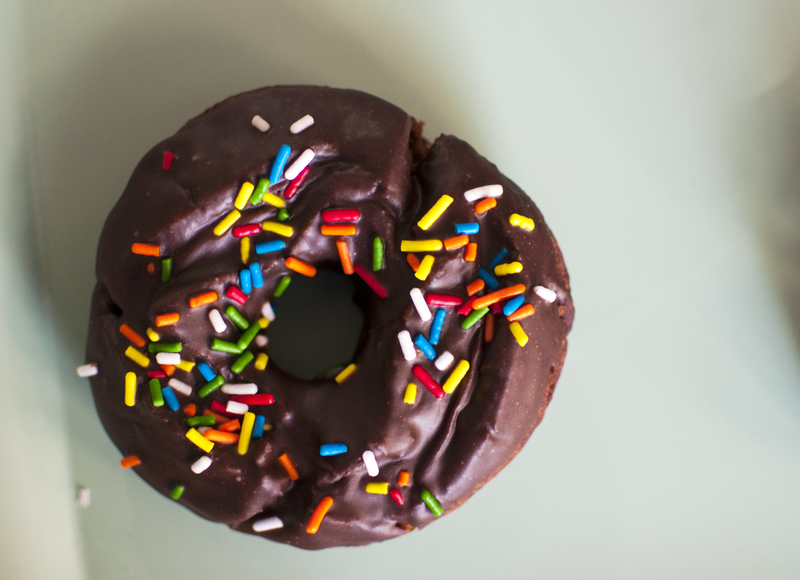 Yes, every time I visited this doughnut shop (which was frequently), a double chocolate was a requirement. 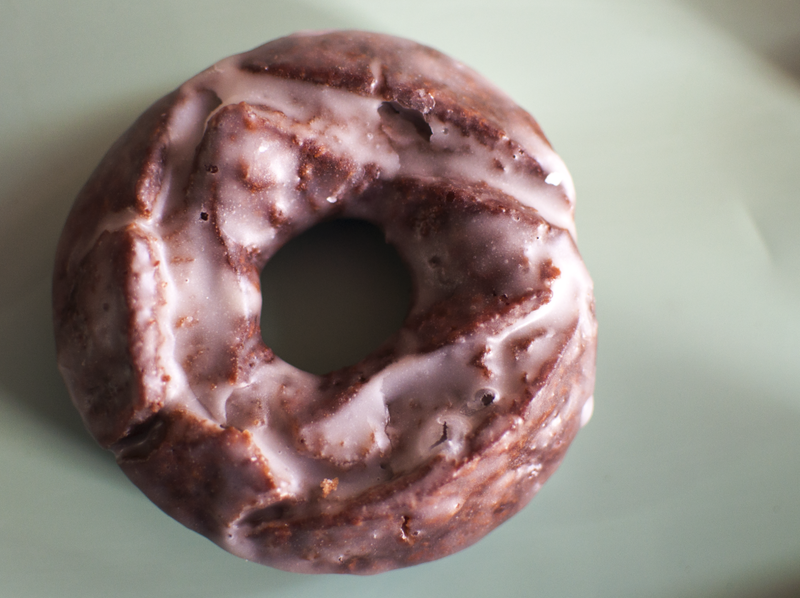 These fried chocolate cake doughnuts are reminiscent of my childhood. My favorite recipes are those that tend to have some kind of sentimental value. Whether the recipe is one that I actually did grow up making, or if the recipe reminds me of something I ate as a kid, there’s just something extra special about these kinds of recipes. 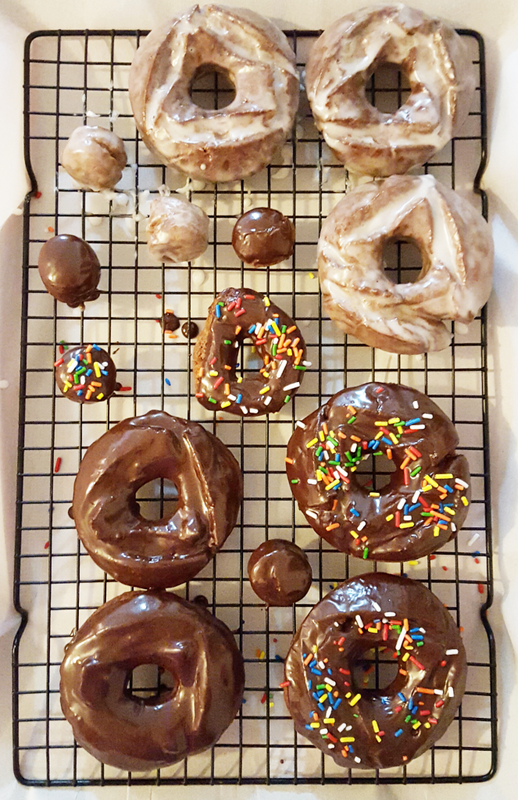 My roommate, her boyfriend, and I whipped up these doughnuts as an “RBE” (roommate baking endeavor) one Sunday a few months back. While I didn’t like them quite as much as I enjoy the old-fashioned sour cream doughnuts, this chocolate version is still pretty fantastic. They’re rich and cakey, and they fry up beautifully. The glaze is probably what makes them, as it seals in the moisture. We made a clear glaze to dip the entire doughnut in, plus I had to make a slightly thicker chocolate glaze to go on top of some doughnuts. 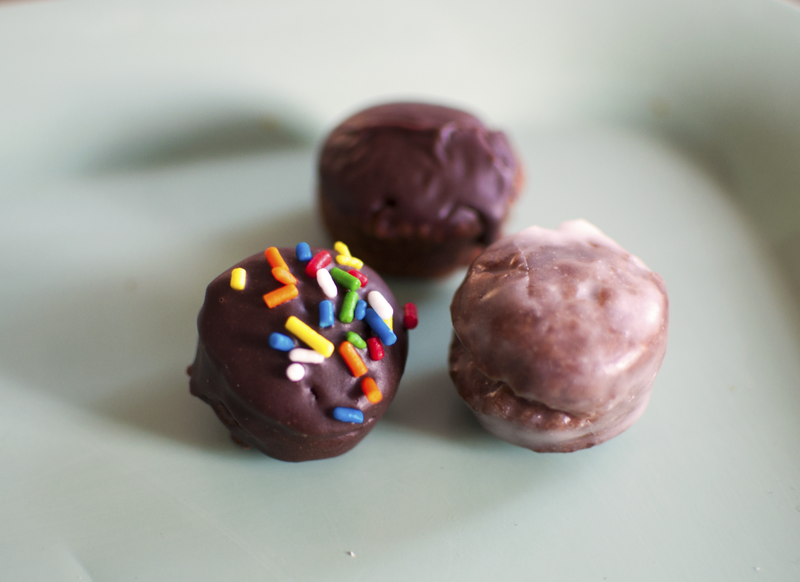 The end result reminded me of my childhood, and I think that’s my favorite part about these doughnuts. I wish I could still inhale three doughnuts and not gain ten pounds, but alas. It’s still super neat that you can fry up a relatively small batch of doughnuts in your own kitchen – and let it take you back to your childhood. Yield: About fourteen doughnuts, plus doughnut holes. 1. In a medium bowl, sift together the dry ingredients: cake flour, cocoa powder, baking powder, salt, and nutmeg. 2. In the bowl of a stand mixer fitted with the paddle attachment, beat the butter and sugar together until a sandy consistency is achieved. Add the egg yolks, and mix until light and thick. 3. Add the dry ingredients to the mixing bowl in three editions, alternating with the sour cream, and ending with the dry mix. The dough will be pretty sticky. 4. Once the cohesive dough has formed, remove the dough from the mixer bowl and form a disc of dough on a sheet of plastic wrap. Wrap up the dough tightly, and chill for at least one hour, or until it’s a bit more firmed up. 6. Pour two inches of canola (or vegetable) oil into a heavy-bottomed pot, and attach the thermometer to the pot. Heat the oil to 325 degrees F.
7. Fry the doughnuts a few at a time; be careful to not overcrowd the pot. You’ll need to fry each doughnut on each side for about two minutes. Allow the doughnuts drain on a paper bag to soak up the excess grease. 1. For both of the glazes, the process is basically the same: Mix all ingredients in a bowl with a whisk until smooth. Feel free to add a bit of corn syrup to the chocolate glaze for extra smoothness/shine. 2. 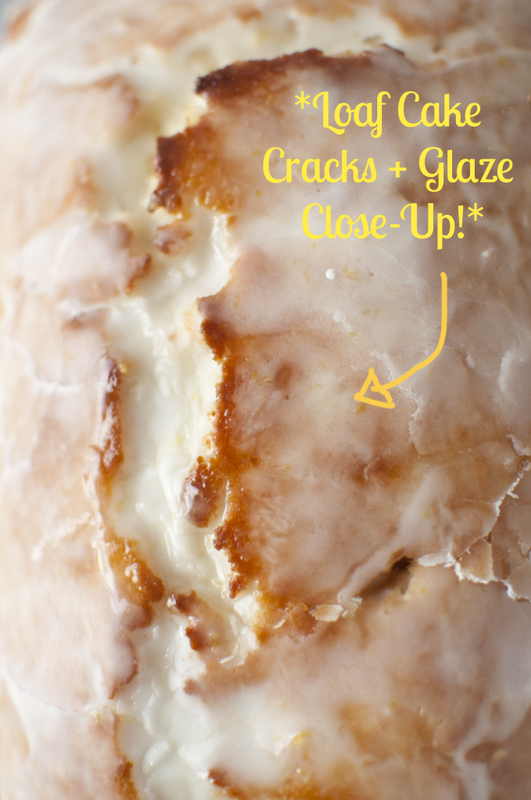 As your doughnut are fried, immerse each doughnut into the glaze of choice. 3. Place the glazed doughnuts on a wire rack above a sheet pan to catch any excess glaze. Allow them sit for 20 minutes until glaze is set. 4. Doughnuts are best served the day they are made, but may be stored in an air-tight container at room temperature for a few days. Enjoy! 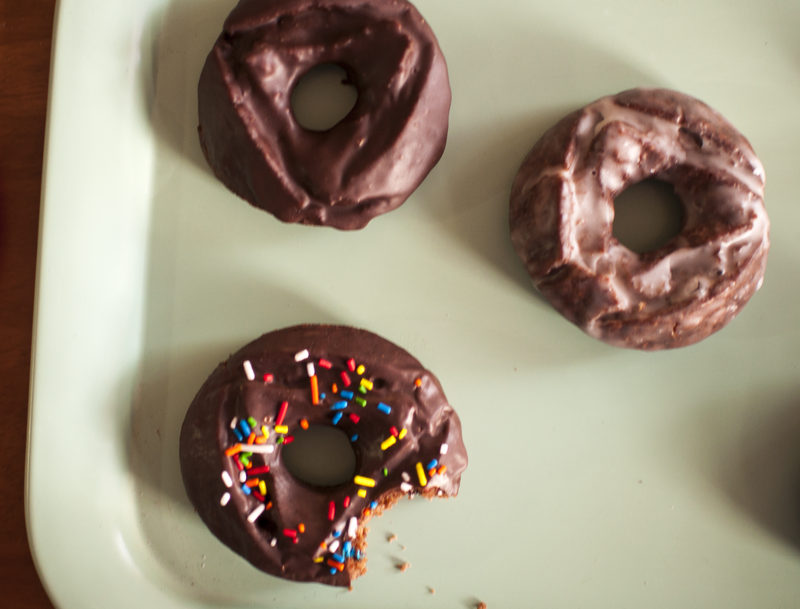 + Old-fashioned chocolate doughnuts recipe from Handle the Heat. 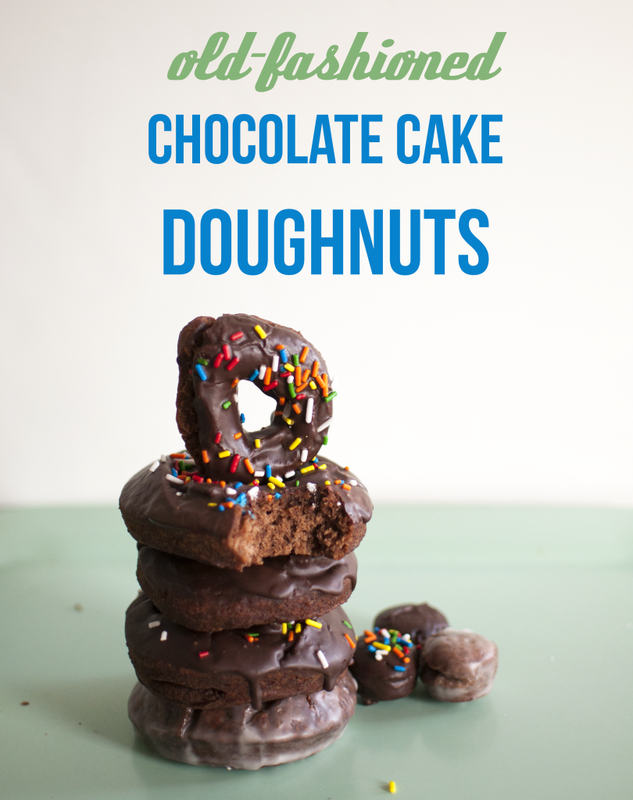 + Chocolate glaze recipe from Joy the Baker.